What Is Quebec's Patriots Day Journée des Patriotes? What is the significance of Journée des Patriotes? Not to be mistaken with New England's Patriots' Day, Quebec's Patriots Day -Journée des patriotes- is the 2003 replacement of Fête de Dollard. And the Fête de Dollard was the 1918 replacement for Victoria Day. So on the Monday preceding May 25 of every year, the rest of Canada observes Queen Victoria's birthday, but Quebec prefers to nod in the direction of the Rebellions of 1837-1838. The Rebellions of 1837-1838 were a civilian uprising that transcended culture and mother tongue. These rebellions directed against British rule came about for the same reasons most citizen uprisings do. Corruption. Cronyism. Oppression. Injustice. Class warfare. Long story short, a hodge podge of French and English-speaking settlers stood up against what was perceived as class warfare, overt cronyism and favoritism toward the wealthier portion of recent British immigrants, this, to the detriment of long-established pioneers and farmers scraping by in the midst of a near-famine brought on by poor crop yields. At the time, the appointed governor in Lower Canada and the lieutenant governor in Upper Canada were more or less in absolute charge, vetoing the elected legislative assembly at any time and for any reason, nor matter how financially and politically self-serving their justifications were, effectively muting the people's voice in favor of a small pool of personal agendas. Among those rebels was a man commonly vilified by some Quebecers as a traitor, notably those with Quebec sovereignty leanings who perceive his eventual allegiance to the Queen's administration as akin to treason against his French roots. The gentleman in question is one of the Fathers of Canadian Confederation, George-Étienne Cartier. So some see him as a traitor. 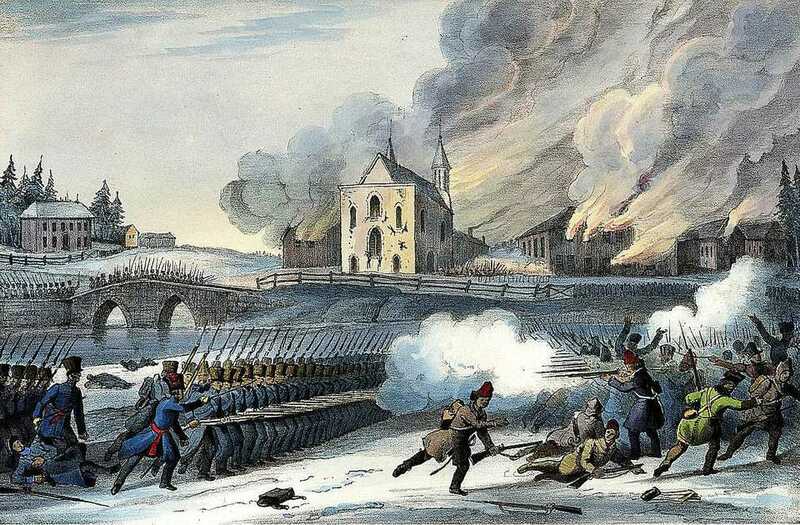 But others conclude he was and is unfairly misunderstood, suggesting that his eventual "chumming up" to the Queen after living in exile from losing the Rebellions of 1837 was actually part of a larger cultural preservation strategy, one that is possibly the very reason the French language prevails in Quebec today. Cartier allegedly believed that a French Canada under British rule had a better chance of preserving its language, culture and institutions than if it was left to its own devices as a sitting duck ripe for American invasion. As history has shown, Cartier's reasoning has merit. The French language, while arguably strong in Canada's modern-day Quebec, is practically extinct south of the border even though French settlers set root in different parts of the United States. But Why Did Quebec Replace Fête de Dollard with Journée des Patriotes? Replacing Victoria Day with Fête de Dollard, at least in spirit, on May 24, 1918, and then officially in 1919 was ostensibly in response to the Queen's unpopularity with French Quebec. It seemed like a good idea at the time to commemorate New France colonist Adam Daulat, a young soldier otherwise referred to as Dollard des Ormeaux who died in battle at age 24 in 1660. For many years, he was painted as a heroic martyr who sacrificed himself for the future of New France. But in the 20th century, a growing body of historians suggested that the provincial hero unceremoniously ambushed and attacked Iroquois forces who were not about to attack colonists instead, and yet others believe he actually blew himself up in a drunken stupor rather than in strategic battle. This tenuous debate eventually paved the way for a new historical event to commemorate, hopefully, one that would produce less controversy and, well, embarrassment. Enter the Rebellions of 1837 and Patriots Day. Under Quebec Premier Bernard Landry's administration, Fête de Dollard was replaced with Journée des patriotes in 2003 "to underline the importance of the struggle of the patriots of 1837–1838 for the national recognition of our people, for its political liberty and to obtain a democratic system of government," as per an official Quebec Government administrative decree published November 20, 2002. Of course, political motivations were at the forefront seeing as Landry's party platform is centered on separation of Quebec from Canada. But the Rebellions didn't only involve native French speakers. Putting political manipulations and potential revisionist history aside, Landry's administration makes a great point, and by extension, Quebec makes a poignant statement. The government at the time was corrupt and did not represent the needs of the people, whether they were French or English speakers. So the people rose up, demanding fair representation. It's almost surprising that the rest of Canada hasn't followed suit and replaced Victoria Day with Patriots Day or at the very least honor them side by side. It's historical moments like the Rebellions that shaped Canada into what it is today. A democratic nation. While some people tend to present the Rebellions as a French vs English battle, and by extension paint those who celebrate Patriots Day as pro-Quebec separatists and those who celebrate Victoria Day as pro-Canada federalists, those same people reveal an interpretation that is at best cursory and superficial, and at worst, flawed, incomplete and completely lacking in historical insight. Myriad were English speakers, notably the Irish and even British lower classes, who were disdained and belittled by 19th-century British imperialism as the Old World attempted to impose its rigid, exploitative class structure onto a New World struggling to build up its own set of values. And Upper Canada -a predominantly English-speaking region- rebelled against British rule too. Granted, Upper Canada uprisings were short-lived, less intense and featured significantly fewer "rebels" and deaths than in Lower Canada, but that may have had something to do with timing. And fear. Lower Canada French settlers, who rebelled first, had lost in battle and may have been viewed by Upper Canadians as a cautionary tale of what would happen to them if they chose to rebel too, arguably thinning out the pool of potential uprisers. But as usual, there's more to the story.